Today at noon, we will welcome 14 families into homeownership at a home dedication in the northeast community of Redstone. 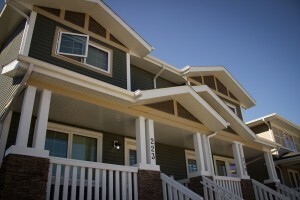 Today also marks World Habitat Day – the one day set aside globally to reflect on the basic right to adequate shelter – so it is a special time to celebrate the impact that Habitat has made right here in Calgary. We broke ground on this project in March 2014 and have worked with numerous sponsors, community partners and volunteers over the past year and a half to move the project along. More than 1,700 volunteers have contributed nearly 29,000 hours toward this project and completed 10 homes, with the other four homes expected to be ready by Christmas. Our homeownership model is a permanent solution to poverty. It’s truly a “hand-up,” not a “hand-out,” as each of these families has contributed 500 volunteer hours of “sweat equity” to the construction of their own home or to other Habitat projects. Faisal, Lubna and their three children are one of these families, and moved into their new Habitat home last December. “Before going inside, we didn’t know what to feel," Faisal said. "But as soon as we entered the house, we were so excited and anxious and our eyes overflowed with joy. We can't explain the feelings that we had when we saw your efforts." We are proud to welcome each of our 14 hard-working families into homeownership, and excited to celebrate with the members of the community who have made it all possible.